The days were getting cooler and the leaves were on their way to changing color as our side of the equator started getting ready for its winter nap. The sun hung lower in the sky, dipping below the horizon earlier than I ever want it to, and I knew that we had to get out to see the countryside before the trees were bare. 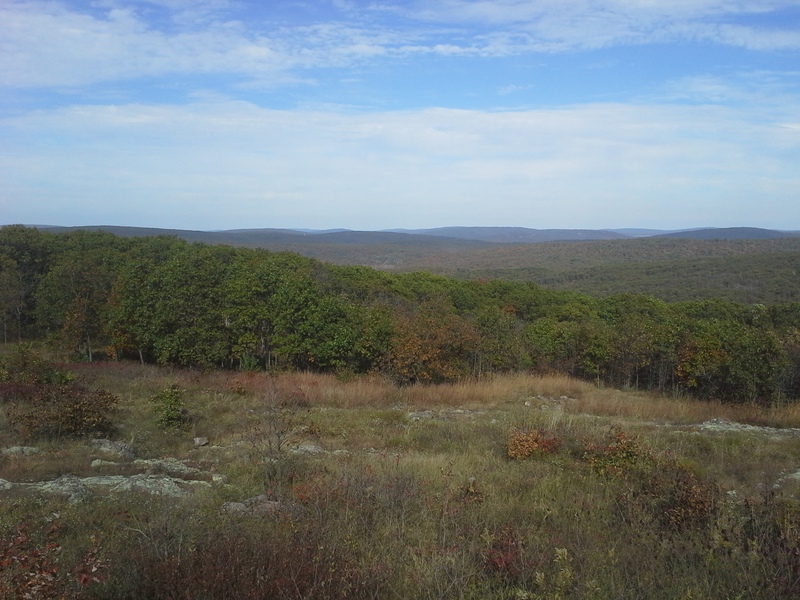 One of the best places for epic, sprawling views in Missouri is around the top of Taum Sauk Mountain, toward the west-central edge of the St. Francois Mountains in the south-eastern part of the state. 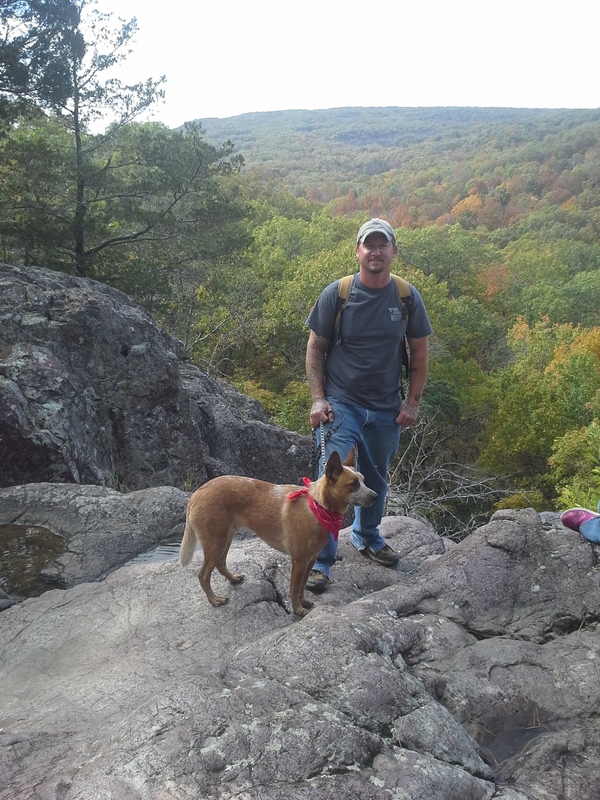 At the top is also the highest point above sea level in Missouri, and a hike along the loop trail to Mina Sauk Falls was exactly what we needed on a Sunday afternoon. So we loaded up the car and headed down to check out the view. From the St. Louis area, you have two main route options. One is to head south along Highway 21, which is more scenic, but a bit over 2 hours. The other is to take Interstate 55 to Highway 67, which is about an hour and 40 minutes. If you have the time, take the longer route on 21. It is curvy and scenic, and travels through and near a lot of neat places. On this day however, we headed down Interstate 55. From 270 and 55, take Interstate 55 south for about 23 miles, and get off at exit 174B, which is Highway 67 south. Take 67 south to Farmington (about 36 miles), and get off at Highway 221. Take 221 west (right) for about 7 miles out of Farmington, and then turn left and follow it south for about another 9 miles into Pilot Knob, and Highway 21. Turn left on 21, and take it south for almost 7 miles to State Route CC. Make a right on CC and head up the mountain for probably 3 miles, to the top. The observation deck will be on your right as you drive in on your way to the Mina Sauk Falls trailhead. 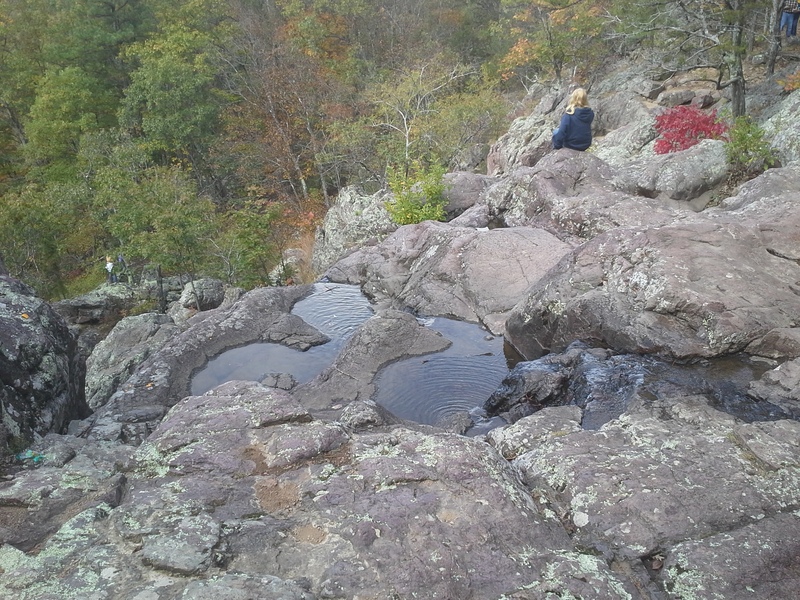 The Mina Sauk Falls trail is a rugged 3 mile loop, which takes you out around the mountain to Mina Sauk Falls and back. 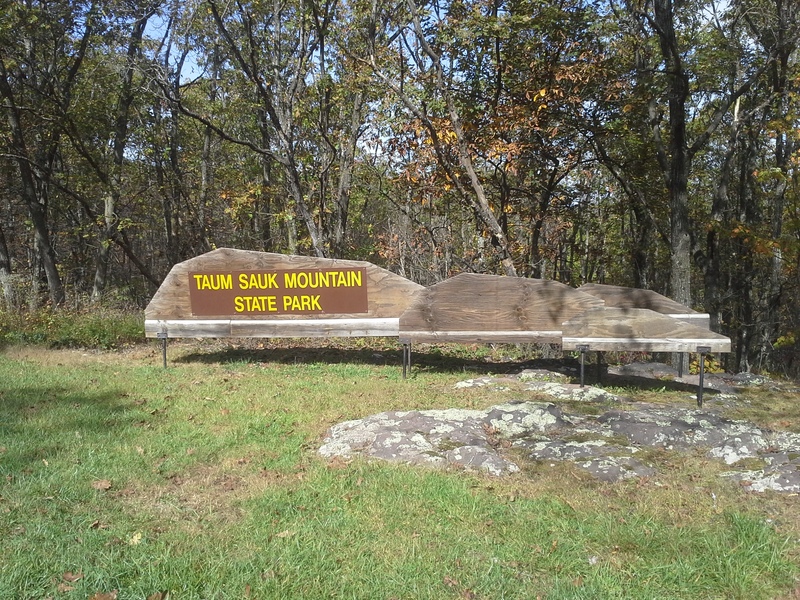 It also shares about a mile with the Taum Sauk section of the Ozark Trail. On this day, we followed the arrows and took it counter-clockwise. 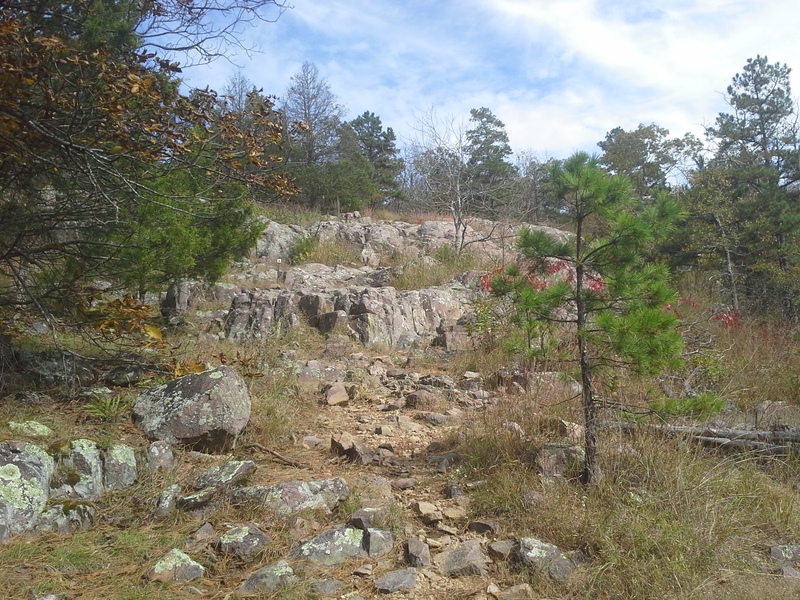 From the trailhead at the parking lot, the paved section of the path (accessible to adventurers of every capacity) curves around for about a quarter of a mile, and takes you to the highest point in Missouri. Just before the highest point, a branch off to the right where the path turns to forest floor takes you to the loop part of the trail. 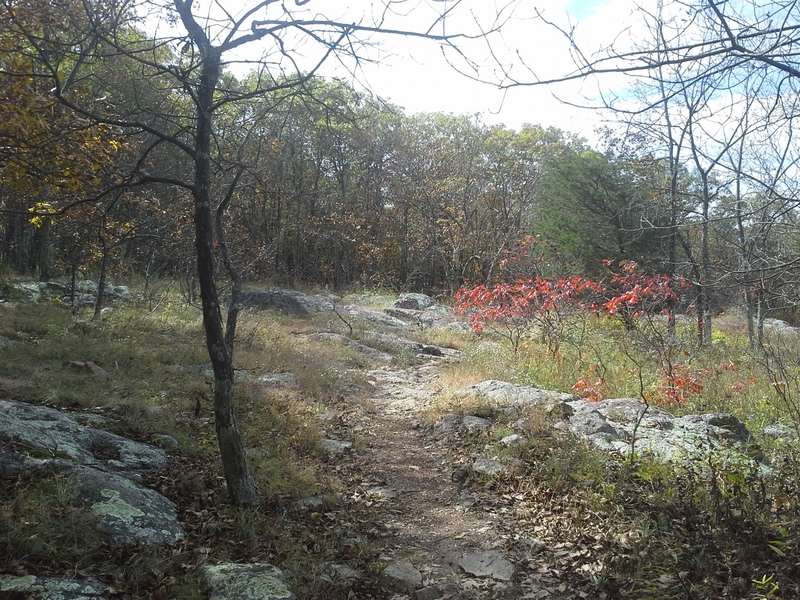 We turned right at the loop, and the path starts to descend in a wide curve along a pretty rocky section of trail, with many loose, ankle twisting stones along its length, eventually coming to a section of glades and overlooks. It continues to descend, with just about the steepest parts of the hike in this section, continuing to curve around and finally emerging at Mina Sauk Falls. 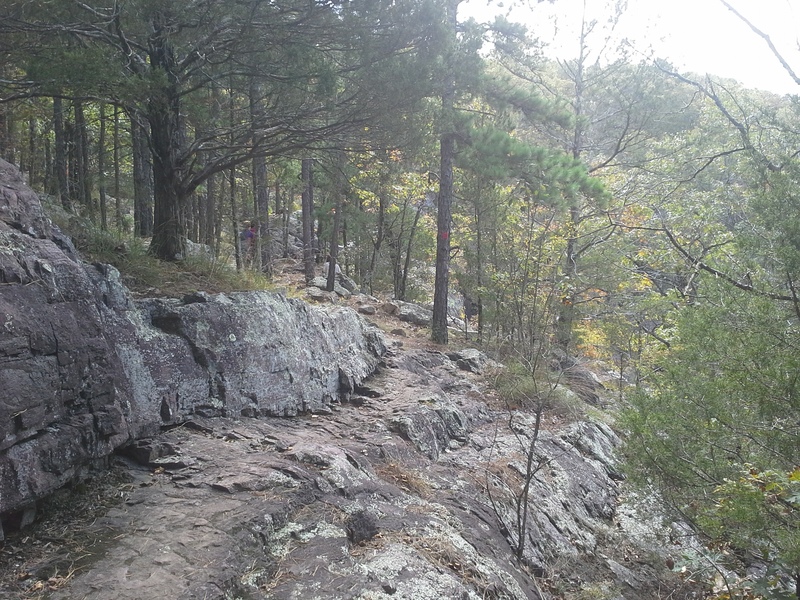 Here is where the Ozark Trail branches off and continues down the mountain toward Johnson’s Shut-Ins State Park. The Mina Sauk Falls trail then turns a sharp left and heads up through glades and bigger exposed rock areas, making its way back into the forest, gradually ascending before leveling off near the start of the trail. The views along this trail are pretty awesome. From the open glades to the deep, rocky, forested waterfall to all the steep hillsides that make up the area, this is definitely a scenic hike. A lot to see, from every opening in the trees. 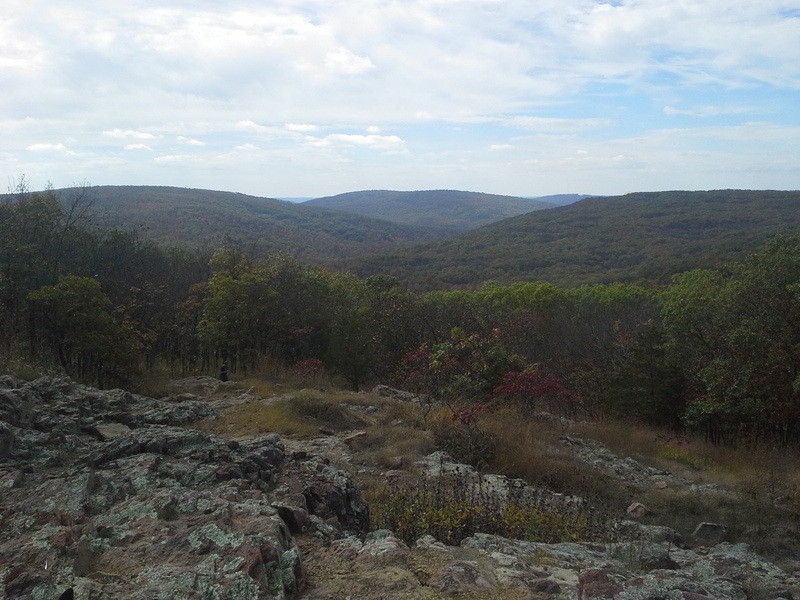 At one point along the trail, looking west in somewhat the direction of Johnson’s Shut-Ins State Park, you can see the silver glint of the edge of the Taum Sauk Reservoir, high atop Proffit Mountain. Make it a point to visit that park on another trip, and hike the Scour Trail, which takes you through the area that was washed away when the reservoir burst almost 9 years ago. 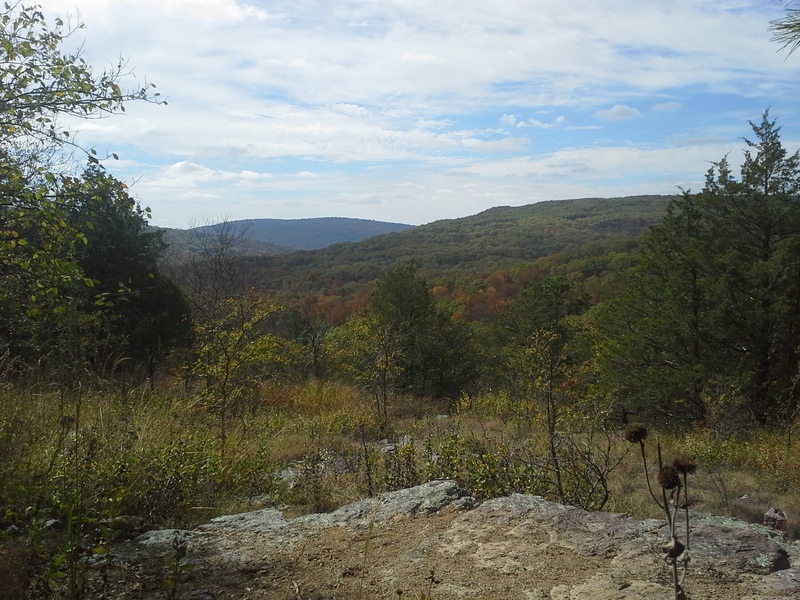 The St. Francois Mountain Range is actually a personal point of Missouri pride for me. They were formed by ancient volcanic activity almost one and a half BILLION years ago. They are considered to be the oldest mountain range in North America, and out date the Appalachian Mountains by more than a billion years. They have rounded tops due to so many millennia of exposure to the elements and changing of the environment, and have been the source of mining operations for all sorts of minerals and metals for nearly 300 years. Little known facts, and I think it’s pretty cool that we have them here in Missouri. Besides the fact that it is the tallest waterfall in Missouri, the story that I have heard about the name of Mina Sauk Falls is one about two young Native Americans who lived in the region many years ago. Mina Sauk was the daughter of Chief Sauk-ton-qua. She had fallen in love with a warrior from a tribe of Osage, who were their enemies at the time. When she left to be with him, her father and his tribe tracked them down and threw the Osage warrior from the top of the bluff, to his death. In her sadness, she followed him over the cliff, to die alongside him. The Great Spirit was so angry at Sauk-ton-qua and his people for destroying the love between these two that he struck the mountainside with lightning, tearing open the rock face, from which a stream of water burst forth. The water that flows over the edge of Mina Sauk Falls is said to be the tears of this young princess, mourning the love that she shared so long ago. 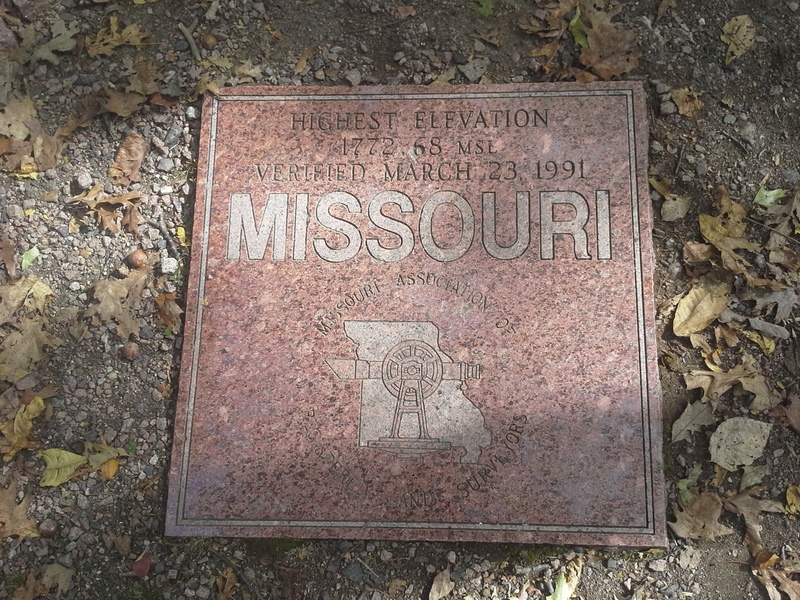 The highest point in Missouri is a pretty exciting prospect, but as you stroll down the paved path up a barely noticeable slope, don’t be let down by the anti-climactic quality that you may feel when you get to the boulder and the etched Missouri Red Granite marker just in front of you in the woods. Yes, it isn’t some sharp peak or mile high bluff…but really afford it some contemplation, snap a couple pictures of your group, and appreciate where this puts you in relation to everything else in Missouri. This is a rugged 3 miles of trail. These are some of the steepest areas in eastern Missouri, and there are a lot of loose and slippery rock areas to travel over and through. Don’t let that deter you from this glorious hike, just be aware and take your time. Don’t expect a lot of solitude on this loop, especially in prime hiking season in the spring and fall. This is a popular trail for good reason, and a weekend afternoon can welcome you with a packed parking lot. Practice good hiking manners, and travel patiently when there is traffic, especially when you get to the falls and there are people in front of you that are enjoying the view, and there are people behind you waiting for their turn as well. Any pictures that I share on here cannot convey what it is actually like to be there. 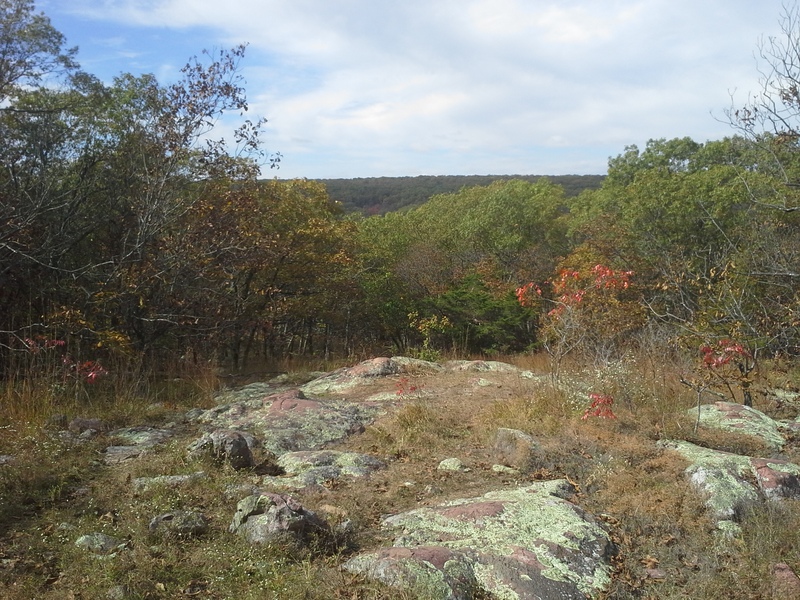 To be able to stand in a glade and look out across to the steep inclines of the nearby mountains is a pretty spectacular view, especially for Missouri. This is one of the most notable trails that we have to hike in our state, and you should definitely visit it if you haven’t yet. Besides the trail, the observation deck that looks out across the northern spectrum of the St. Francois Mountains is probably my favorite spot in the whole area. It is vast and wide, and you can see for miles. Truly an amazing view, it inspires a sense of immense scale in an adventurer’s soul, and ignites a wonder of what might await on the path to the furthest peaks one can see from there. This location has been on my to-do list for the past year; thanks for the great pictures and valuable information. Love reading your posts. This is a really good one. Makes a lot of trails just look like “filler”. I hope you get the chance soon to get out there. And thanks for checking out the blog! We are planning on hiking this trail in the spring. It is great to hear your experiences to help us with our planning. Sharing these great places with other people so that they are inspired to go there too, is what this is all about for me. Thank you for checking out my posts! I really need to do this trail. So many places to hike, not enough weekends =) Thanks for the great info! Yes! You do need to hike this trail. This is one of my favorites!